Annual gingerbread making was the grandest ever this year. 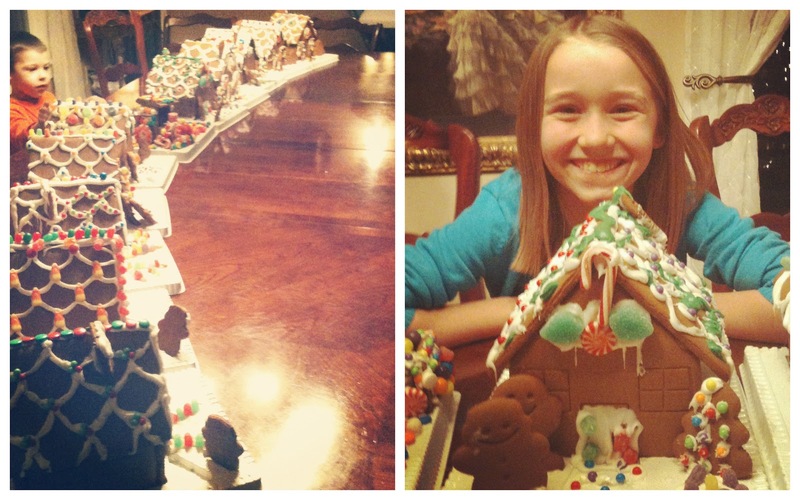 11 kids, 10 houses, and one gingerbread train. Grammy Tami outdid herself this year, and once again she buffed the table so we could get the beautiful reflection of our gingerbread village. 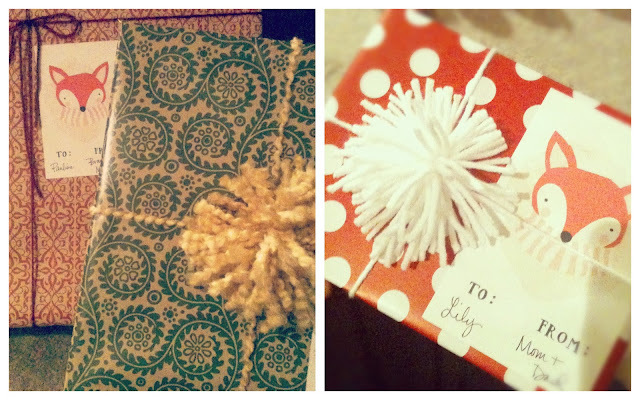 Wrapping presents has always been a favorite of mine. Even as a little girl, I loved it. This year, I used yarn to make cute pom poms and simple bows for gift toppers. The adorable fox tags are from here. One of our favorite traditions is placing the star atop Grandma Shirley's tree. This year her tree was the B-I-G-G-E-S-T ever. An insanely fat tree. 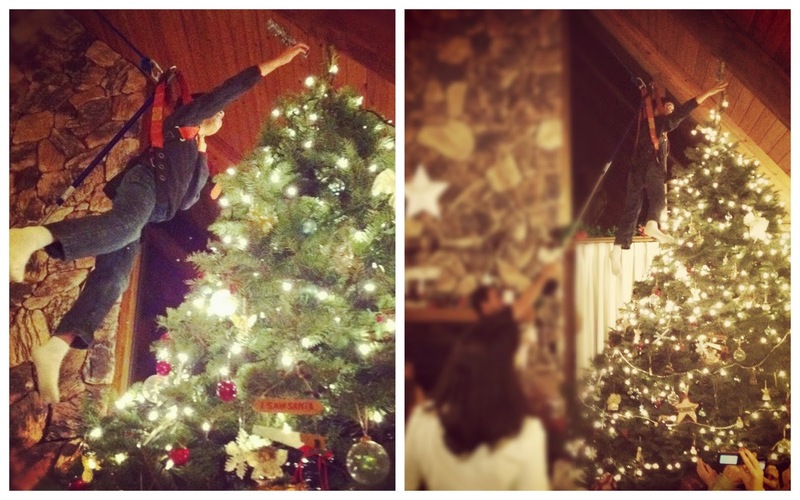 The only way to place a star on a tree so big is to use a pulley system and a child. Every year, we harness up one of the vulnerable small children and send them flying in the air to set the vintage star on top. It is the BEST tradition. 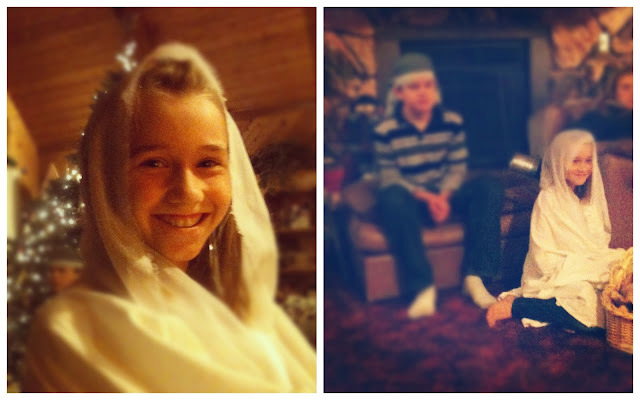 Once the star is placed, we get serious and dress the children in robes, head wraps and shawls and we act out the nativity, complete with angels on the staircase and songs for all to sing along with. This year, Lily was Mary and she did a fine job being great with child. There were some themes this year throughout our gift giving. Scarves, sweaters, and things with an electric motor. Ethan and Lily love their new red electric scooters and Madeline is happy to now have her first car. Santa was good to us. b: We were able to attend church on Sunday morning and listen to beautiful music. This made the day perfect. 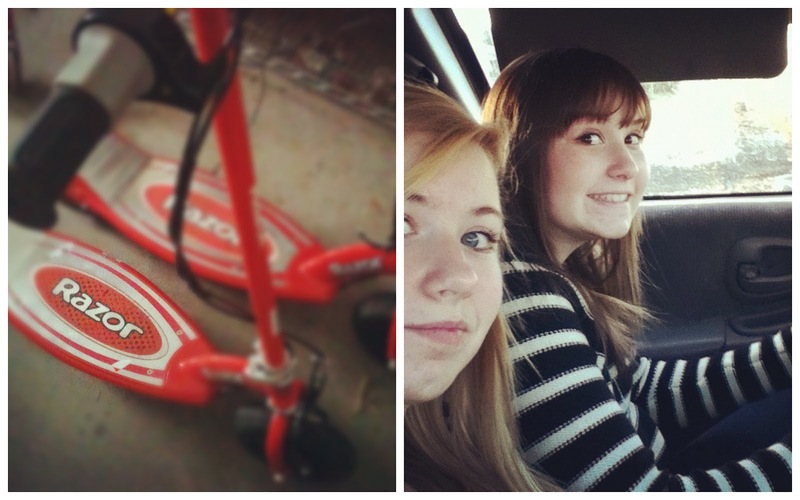 Now, we are just enjoying the last few days of Winter break. We've seen two excellent movies: War Horse and The Adventures of Tin Tin. We are also making plans for New Years and setting goals for 2012. I'm hoping to get back here tomorrow to share my favorite albums of 2011. Stay tuned!